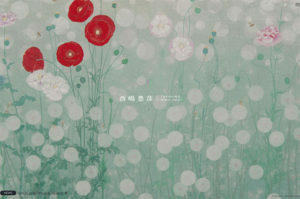 Japanese Art Exhibition “Original & Real 2019” starts April 22, 2019. 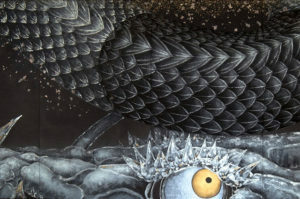 This exhibition showcases contemporary Japanese Fine Arts & Crafts including nihonga (Japanese style painting) and will be held in 5 places -Tokyo, Kyoto, Kanazawa, Osaka, Nagoya. Toyohiko Nishijima shows his Japanese painting artwork. This exhibition is an art auction, and everyone can bid for it. Please feel free to ask the staff at the exhibition if you wish to bit for art items. The bid opening ceremony will be held at Tokyo Art Club in May 29, 2018. April 22 Mon. to 26 Fri.
April 28 Sun. to 30 Tue. May 7 Tue. to 9 Thur. May 14 Tue. to 16 Thur. May 21 Tue. to 23 Tur. May 25 Sat. to 28 Tue. 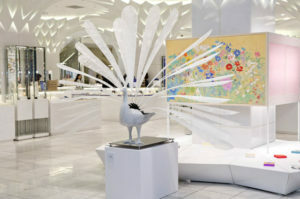 Nishijima firstly challenged to set art installation at the department store in Tokyo (Nihombashi Mitsukoshi). This installation is consist of nihonga (Japanese style painting), robot art and Ewashi paper art. White peacock on the photo is a robot and covered by Japanese paper “Ewashi”. I will hold my personal art exhibition at the department store Mitsukoshi Nihombashi in Tokyo from September 5 to 10. Please drop in and see artworks when you come over. 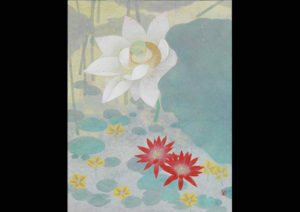 The department store Mitsukoshi Nihombashi will hold Japanese painting group in Kyoto exhibition “Nihonga Kyo from July 25 to 30. Please drop in and see artworks when you come over. 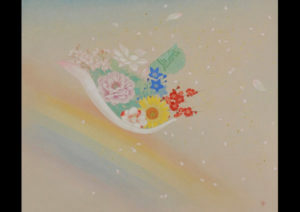 The department store Daimaru Kouchi will hold Japanese painting group exhibition “Draw on Tosa paper. Brand new Japanese painting artworks 2018″ from July 4 to 10. Please drop in and see artworks when you come over. *Tosa is the former name of Kouchi prefecture. Japanese Art Exhibition “Original & Real 2018” starts April 23, 2018. This exhibition showcases contemporary Japanese Fine Arts & Crafts including nihonga (Japanese style painting) and will be held in 5 places -Tokyo, Kyoto, Kanazawa, Osaka, Nagoya. 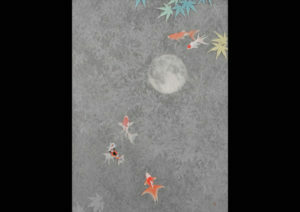 Toyohiko Nishijima shows his work that fused his original paper ewashi and Japanese painting. April 23 Mon. to 27 Fri.
April 30 Mon. to May 2 Wed.
May 7 Mon. to 9 Wed.
May 14 Mon. to 16 Wed.
May 21 Mon. to 23 Wed.
May 25 Fri. to 28 Mon. 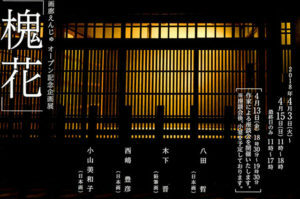 Gallary Enju opened on 3rd April today, which is located in Higashiyama, Kyoto. It exhibits my paintings until 15th April. Please drop in and see me when you come over here. Today on February 22nd 2018, Nishijima Toyohiko turns 52 years old. He asked for his new homepage to be launched specifically on this date. We have worked on this as he requested and here we are: the web site is now relaunched in its updated format. In this site, we present a lineup of Nishijima Toyohiko’s works from past to present and share with you his journey. This is his personal website, and we hope you enjoy every aspect of it. The reason for updating the site lies in the number “52”. Nishijima’s father was diagnosed with cancer at the age of 52, and this had a material impact on Nishijima as a human being. Nishijima recently shared his thoughts on turning 52 with me. Nishijima has decided to relaunch his homepage on this special day. There is an additional purpose here as well. First, he has collected together his works and the stories of his journey on this website. He wants to go beyond what he has achieved up till now, and to be more public with his work by publishing more of it. 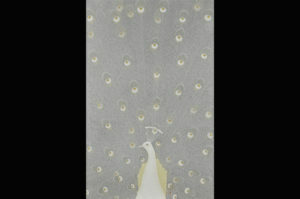 As highlighted in the title, the theme of the upcoming exhibition of Nishijima’s work is ‘Release’. At this moment, we do not quite know how or in what format this theme of ‘Release’ will be expressed. The concept and notion of art means different things to different people – so the explanation he gives you at the time of the exhibition might actually be quite limited. But what I want to tell you now is that this exhibition will take place on September 5th at the Mitsukoshi department store, Nihonbashi, Tokyo. Nishijima is currently hard at work and is relishing the opportunity to share his expression of the theme of ‘Release’ with his audience.